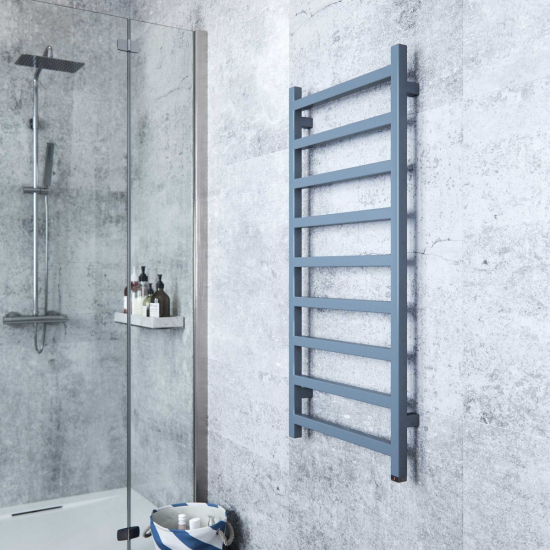 Terma Simple ONE designer towel rails provide independent bathroom heating with a chic aesthetic - a definitive upgrade to conventional bathroom heaters. Styled with flat geometric bars and an attractive blue finish, the Simple adds a designer accent to bathrooms, en-suites, and washrooms. The Terma Simple provides elegant bathroom heating with convenient, basic control. Its minimalist, geometric ladder design will look a treat in any modern bathroom looking for a clean and crisp aesthetic. These versions are finished in pigeon blue, adding an attractive accent to bathrooms, washrooms, and en-suites.